Yesterday will remain one of the most special moments of my life, though I never thought standing in a dirty river would make this much of an impression on me. Yesterday was my first day to baptize anyone so I to get my practice in I started with almost 50. Bro. Bill (Liz’s dad) and a volunteer team from Arkansas are here at Angel House this week. Some of them will be working on the hostel previously mentioned in this blog. Some of them will be working with local nursery students. All of them will be loving on and interacting with the kids and the community. However, I am sure that the most special day of their trip, at least for me, will remain this past Sunday. We started with a morning church service were we saw the school classroom the church meets in packed as never before with not only the Angel House kids, but also members of Gamasara village and the larger community. 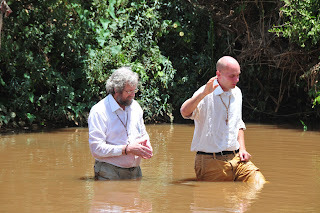 We worshiped together and then headed to the river for the baptism for which we have spent a month in preparation. The highlights are too innumerable to count. Bro. Bill lead the service and lead me into this new act of ministry. We had many children from Angel House be baptized with looks of joy on their faces (at least after they got over the cold water). We also had staff members get baptized, some alongside their families. 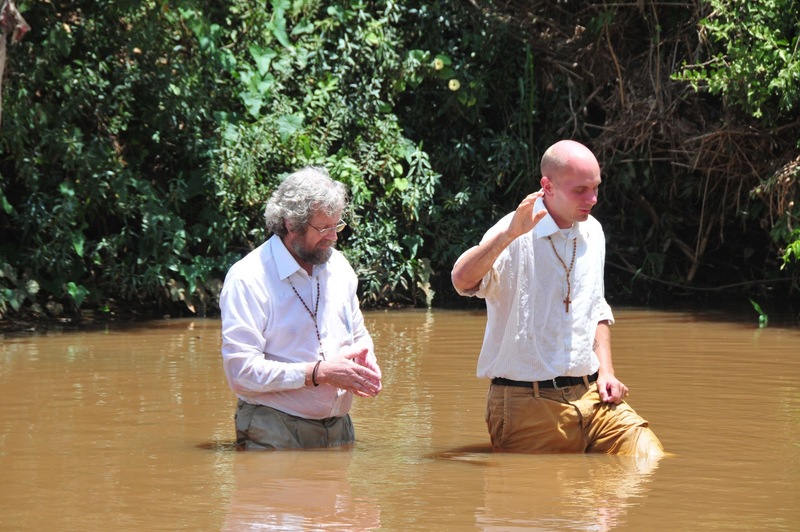 A man was baptized who just the week before had agreed to give up the witch doctor medicine he had been practicing for his whole life. We had spiritual fathers and mothers adopt our children at Angel House and others in the community as they entered into a new family, promising to be their mentors and to help them grow. We had members of the community who had shown up to church for the first time that morning come out to be baptized having heard the sermon and accepted the questions of baptism from the church. It was an amazing experience that left me feeling drained, not from frustration but like I had just finished a race. And the village that has been a major source of recent frustrations is finally starting to respond in a positive way to the presence of Angel House within their community as many of them participated in this day of ministry. Now, I know that after the high wears off that much of the true work will start as the task of shepherding that many new Christians will not be easy. However, I am not alone, they were not baptized into my flock with me as the pastor, they were baptized into a Christian family that is ready to welcome and support them. My prayer is for the growth of the individual people, the growth of the church, and the growth of relationships and change that seems to be starting with this community in which we now live. How beautiful is the body of Christ! Praise God!